The new Pro-Flo® 2 (second generation) offers a complete fully-sequential EFI system with an all-new, powerful electronics package that includes everything you need to convert a carbureted engine to a modern fuel injection system. Starting with a new “flash-programmable” engine control unit (ECU) powered by EFI Technology, a leader in advanced electronic engine management and monitoring systems, the Pro-Flo® Gen-2 allows for more tuning features, fully sequential injector firing and limitless calibrations in a compact package. The Pro-Flo® Gen-2 includes a new software package with a graphic user interface that is user-friendly with an updated look. Additional software features include choice of Edelbrock exclusive hand-held calibration module (for tuning without a laptop) and new for Pro-Flo® Gen-2 has the option to laptop tune also, giving you the best of both worlds! Two tuning strategies include speed density (engine speed vs. manifold absolute pressure) and alpha-N (engine speed vs. throttle position). Included are base calibrations for common AMC, Chevy, Ford, and Chrysler applications. A narrow band O2 sensor is included and is also wide-band 02 compatible (wide band O2 not included). The complete package includes: intake manifold, throttle body assembly, fuel rails, fuel injectors, all sensors, wiring harness, ecu, hand-held calibration module, software, brackets and attaching hardware. Included with every Edelbrock Pro-Flo 2 EFI system is this complete intake manifold assembly, ready to bolt on out of the box. All these components are installed and ready to go: fuel injectors, fuel rails, air valve and throttle sensor, fuel pressure regulator, idle air control, PCV port and more. Every assembly is pressure tested at the factory, then matched to a specific Calibration Module and ECU with a serial number. Featuring flash-programmable memory and full sequential injector firing this ECU was engineered by EFI Technology, a world leader in advanced electronic engine management. The flash memory allows multiple tuning options including Map-N (Speed Density) and Alpha-N (Speed Throttle). Base calibrations for common performance engine applications are included on the supplied CD and a base calibration is preloaded. Additional calibrations are available online at www.edelbrock.com. Custom calibrations can be created by the user and stored and restored when using the Pro-Flo® 2 PC based software. The system also supports closed loop fuel targets with narrow band O2 (included) or optional wide band O2 controller. Edelbrock pioneered “tuning on the fly” fuel injection systems with the introduction of the original Pro-Flo® fuel injection in 1995, featuring Edelbrock’s exclusive Handheld Calibration Module. This unique handheld control unit is compact in size and plugs directly into your Pro-Flo® 2 ECU for easy access at anytime. The easy-to-read digital display allows you to adjust your fuel, ignition and rpm real-time without the use of a laptop computer. Up to three calibrations can be saved and restored. Initial calibration must be loaded with supplied software using a PC or laptop. If laptop tuning is what you desire the Pro-Flo® 2 gives you this option also. Pro-Flo® 2 allows unlimited custom tuning and enhanced tuning resolution of fuel and spark map via a laptop computer with the included Pro-Flo® 2 PC based software. You can tune, save and restore as many custom calibrations as you desire. 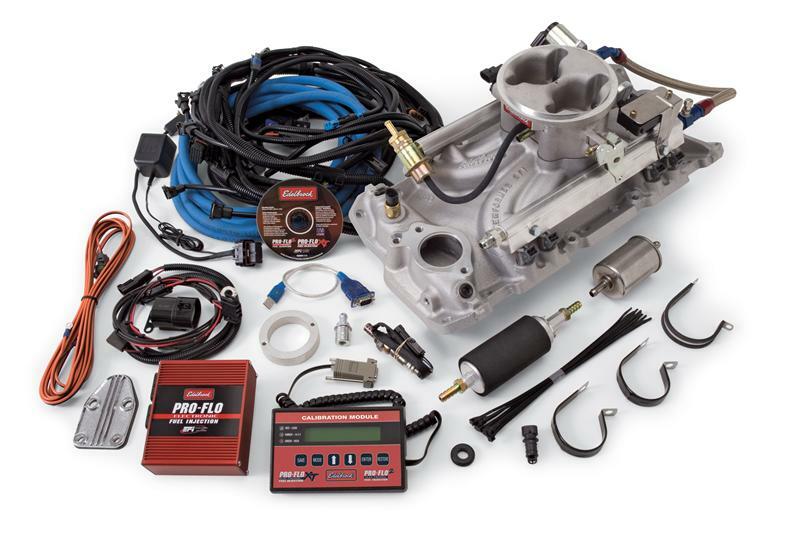 This kit includes all of the necessary components to upgrade a Edelbrock first-generation Pro-Flo fuel injection system to the new second-generation Pro-Flo2. The new Pro-Flo® 2 (second generation) offers a complete fully-sequential EFI system with an all-new, powerful electronics package.